Lift-Foam® is a natural, water-based, biodegradable and renewable resource. You know it better by its trade name, latex. Lift-Foam® is rubber, not plastic, so it’s three times more durable than other types of foam, which increases the “Comfort Life” of your mattress over a greater length of time. WHAT’S THE DIFFERENCE BETWEEN LIFT-FOAM® AND MEMORY FOAM? Both Lift-Foam® and Memory Foam are made with premium mattress materials, but Lift-Foam® offers unique properties that Memory Foam doesn’t. Natural Materials: Lift-Foam® is a rubber-based foam. Memory Foam is a polyurethane-based foam. Lift-Foam® is also more durable. Because Lift-Foam® is vulcanized, it’s the most resilient material available in a mattress. Breathable: Lift-Foam® is naturally ventilated and 25x’s more breathable than polyurethane foam. Its cell structure provides a temperature neutral environment. Memory Foam is a dense material that needs heat to activate its pressure-relieving quality. So instead of your mattress “cocooning” around your body, trapping heat––Lift-Foam® keeps you “elevated,” dissipating heat away from your body. Sleep “On”: By dispersing your weight evenly across the sleep surface, Lift–Foam® has an “uplifting” effect, so you sleep “on” the mattress. Memory Foam’s dense, heat-activated material has a “sinking” effect, so you sleep “in” it. Pressure Relieving and Supportive: Did you know when you lay on your side, your shoulders and hips have almost eight times more pressure on them than when you lay on your back? Pressure relief is important as it keeps the blood flowing to your extremities, so you don’t have numb fingers, hands and arms. More importantly, your body responds to pressure by moving during the night, which reduces the amount of restorative sleep you receive. Unlike Memory Foam, which allows you to “bottom out” onto the hard layer underneath the mattress, Lift-Foam® offers “bottomless” pressure relief for your body. So whether you’re on your back or side, you’ll have less pressure all around. 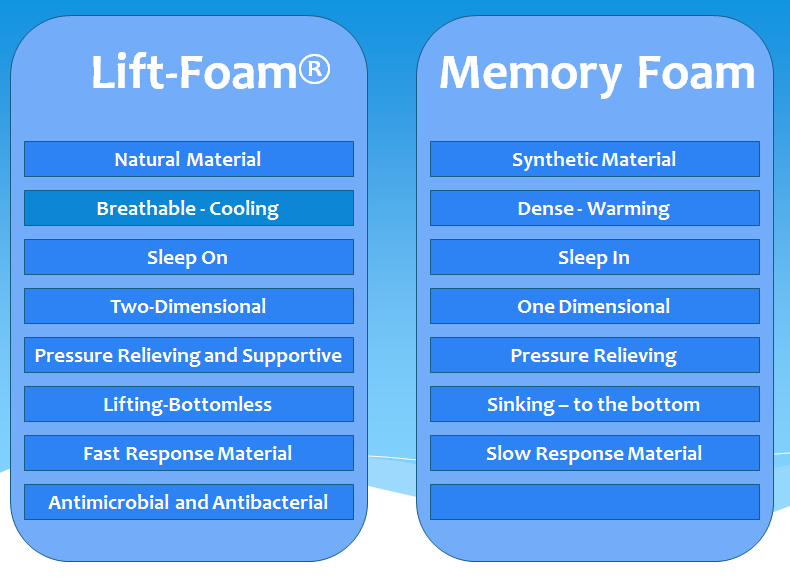 Fast Response Material: Lift-Foam® tends to be more elastic than Memory Foam. The benefit? When you move, it immediately responds to your new position. Antimicrobial and Antibacterial: Lift-Foam® is naturally healthy. It’s naturally mold and mildew resistant. It’s inherently antibacterial and antifungal. Which means you get a mattress that’s good for you and good for the environment. I CAN’T SLEEP WHEN I’M TOO WARM. WILL A LIFT-FOAM® MATTRESS PROVIDE SOME RELIEF? Absolutely. Lift-Foam® is naturally ventilated, providing 30% more airflow than Memory Foam or polyurethane foam. The result? A cooler, more refreshing sleep environment. In addition, all Elevate® sleep systems come with our innovative Outlast® technology that regulates temperature and manages heat and moisture, so you get the sleep environment you’ve always wanted to get the very best sleep. HOW EFFECTIVE IS LIFT-FOAM® AT REDUCING BACK PAIN, PRESSURE POINTS, AND HELPING WITH MY SLEEP PROBLEMS? Lift-Foam® is elastic and giving, without sacrificing support. By keeping you on top of the mattress, instead of allowing you to “sink” to the bottom, Lift-Foam® delivers both proper spine alignment and pressure-point relief your body needs. Lift-Foam’s elasticity also makes turning in bed easy and effortless. IS LIFT-FOAM® HEALTHY TO SLEEP ON? Lift-Foam® is ideal for allergy sufferers. It is naturally hypoallergenic, dust-mite resistant, and antimicrobial, inhibiting the growth of bacteria, mold and mildew, which are contributors to asthma and pulmonary function allergies. No artificial or synthetic materials are added to provide these benefits.